I love smoothie for my Breakfast, so refreshing & filling ones. 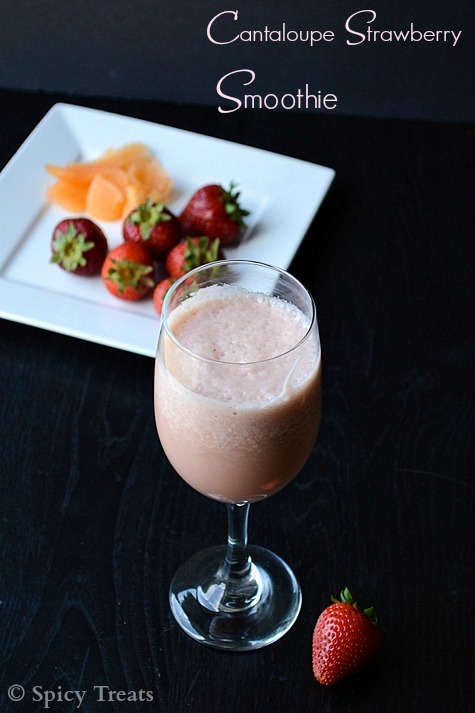 You can blend any combo of fruits/Nuts with milk or yogurt to make a perfect breakfast smoothie. Recently i tried Cantaloupe & strawberry combo and it turned out awesome. Even my kids loved it who generally doesn't like milk based juice/smoothie. But Mocktails are their most favorite drinks. Cantaloupe & Strawberries are rich in antioxidants, controls blood pressure, good for skin and has anti ageing properties and above all both the fruits taste so so delicious and the colour of the fruits really attracts everyone, that too the heart shaped strawberries definitely a favorite fruit of many of us Right?! Generally its good to include more fruits & veggies in our diet and smoothie are one of the best way to add more fruits in single serving. Am trying this kinda smoothie for my breakfast n snacks. Wash strawberries, chop and keep ready and remove seeds from melon and scoop out the center juicy pulp and keep ready. 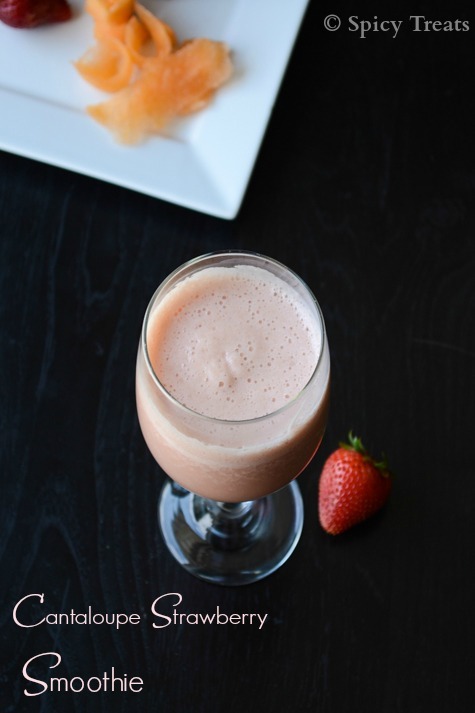 In a blender add cantaloupe and strawberries(add sugar or hone if desired) and blend to a smooth puree and then add milk and blend for few more seconds. 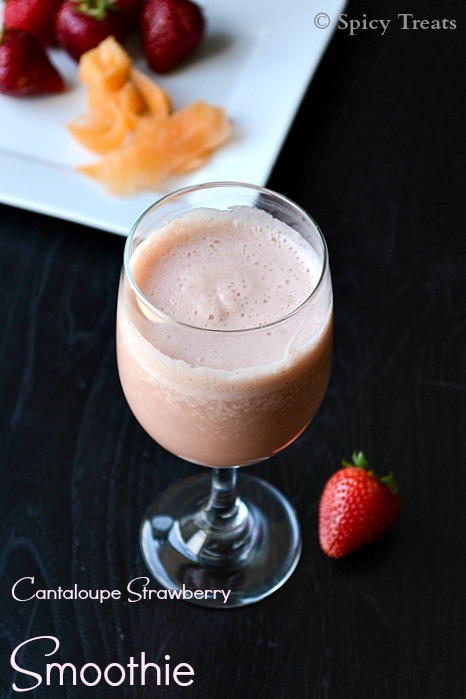 That's it...Healthy & delicious Cantaloupe Strawberry Smoothie ready.Serve immediately. You can also add 1/4 tsp of vanilla for additional flavor and taste. If u like cardamom flavor u can also add a pinch of cardamom powder to the smoothie. perfect !!! love the mild colour.. Refreshing milkshake.. looks awesome !! Such a healthy & refreshing smoothie ! !